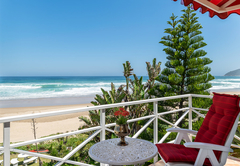 Haus am Strand is a 4 star graded B&B with self catering option, offering Wilderness accommodation for tourists and visitors of on the Garden Route. 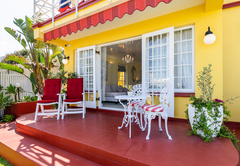 Lovingly and charmingly decorated double-storey holiday guesthouse with an attached bungalow and cottage comprises seven apartments, each with its own entrance. French doors open onto a terrace and large garden. 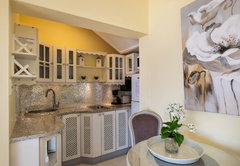 Each holiday-apartment has its own unique atmosphere and decor and is equipped with a kitchen. 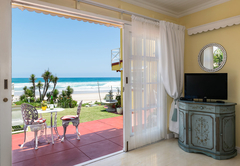 The house offers a five star position directly on the beach and sea views from all apartments. 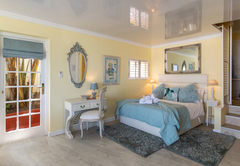 The bathrooms are en-suite with Jacuzzi and shower or bathtub and shower and heated towel rails. The apartments are furnished with very comfortable Queen-size beds with top quality mattresses and bedding, blankets and towels. 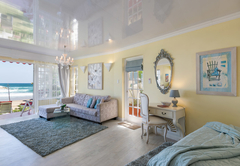 For your comfort we also offer heaters, electric blankets, under-floor heating, fans, hairdryer, safe, a tea / coffee tray, candles, gowns, SAT-TV, CD/DVD-Player and Internet W-Lan. 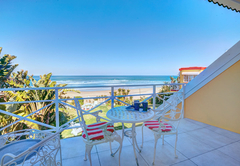 Our beautiful landscaped garden leads right onto the beach. 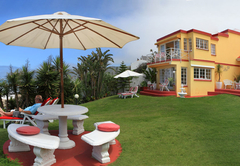 You can grill in the garden or just suntan and relax on the loungers in the shade of the Yuka-Palms. 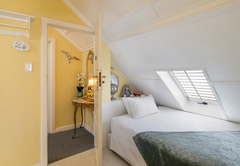 The Mini Suite can be linked to the Garden Suite. 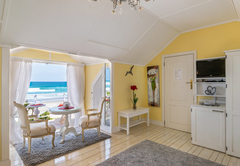 This newly rebuilt B&B suite is a cosy, quaint, small apartment with breakfast making facilities and a sea view from the queen-size bed. The en-suite bathroom is furnished with a Wellness Rain shower. 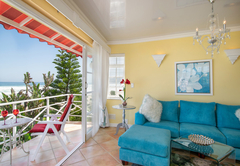 French doors open onto the terrace where you can have breakfast while viewing the ocean. 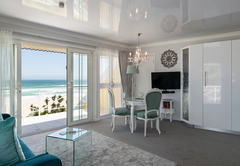 This self catering suite can be linked to the Mini and Traveller Suites. 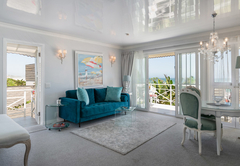 The suite has a beach-house atmosphere with spectacular sea views and large sliding doors opening onto the terrace and garden. The new designer kitchen and living area has Sat-TV, a CD player and two sleeper couch beds (single beds at night and couches with cushions at daytime). The en suite bathroom has a bathtub and shower. 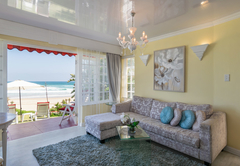 This suite can be linked to the Garden Suite. 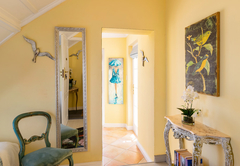 The charming and quaint B&B apartment is equipped with breakfast making facilities. 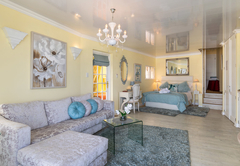 Furnishings include a Queen-size bed as well as a sleeper couch for 3rd person as well as a bathroom with a Jacuzzi and shower. 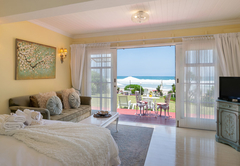 Situated spectacularly close to the waters edge, with the view to match (even from your bed). 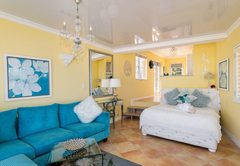 The bungalow is furnished with a Queen-size bed and a sleeper couch. Also available is Sat-TV and a DVD player. 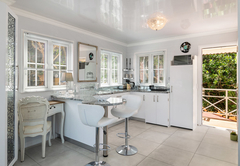 The accommodation has an open plan kitchen and French doors lead onto terrace and garden. The bathroom offers a spa-bath / Jacuzzi and a rain shower. 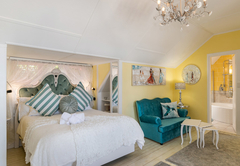 This self-catering cottage (ideal for a family-holiday with children) has French flair with a lovely ambience; homely and happy, with an open plan kitchen and living area. Sleeper couches, heaters and Sat-TV furnish the living area. 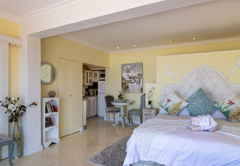 There is another separate bedroom with two single beds or a King-size bed. 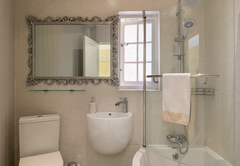 A delightful bathroom is equipped with a bath and shower and towel-heater. Underfloor-heating is provided. 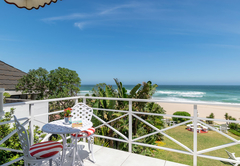 This romantic dormer holiday-apartment has a private balcony and breathtaking sea views. 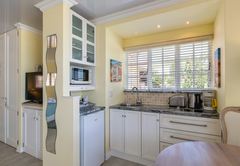 The suite is equipped with a cute doll house kitchen. 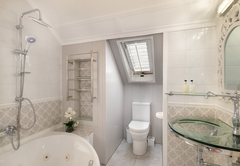 Enjoy the new luxurious bathroom with Jacuzzi, shower and under floor heating. 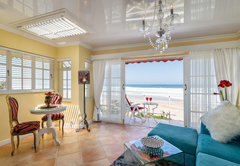 French doors open onto a balcony overlooking the garden and ocean. A sleeper couch is provided for a 3rd person. 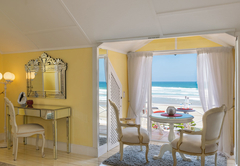 The suite can be linked to the Honeymoon Suite. 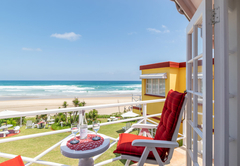 Situated on the first floor and only meters from the beach, this beautiful sunny and light apartment has panoramic sea views from the balcony and living area. The open plan sleeping (Queen-size bed) and living room has a cosy couch on which to relax and take in the splendour of your bird's eye view. 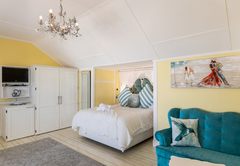 A small dormer bedroom (with Queen bed) with sea views is an added bonus to the suite. Other features are: Flat-Screen-TV, CD-Player, skylight and under floor heating. The bathroom has a corner bath, shower and towel heater. The quaint village of Wilderness is a two minute walk across the road, with a Mini Market and many excellent restaurants and bars. A wellness centre, laundromat, ATM, Internet Cafe, post office, Tourist Info Centre and a variety of small shops can also be found. Enjoy the entertaining Craft Market with live music every Friday afternoon, where you also meet the locals! 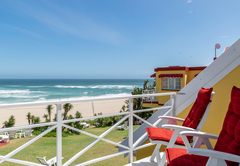 The bustling new Garden Route Shopping Mall with a large supermarket, seven cinemas, many exciting restaurants and 320 shops is a mere 6 km drive away. There are sports and outdoor activities to satisfy everyones needs. 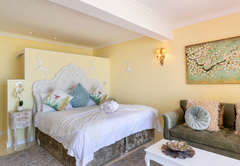 Cosy, quaint, small Suite with sea view from your queen size-bed. Facilities to make breakfast: Kettle, toaster, fridge. 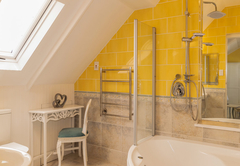 Lovely en-suite bathroom with Wellness-rain-shower, with terrace. Includes BREAKFAST at our partner restaurant with FREE COFFEE. 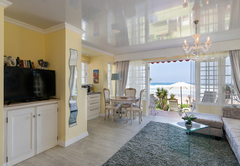 Mediterain Suite with spectacular sea views with large sliding doors. Twin beds/King size with sea view. 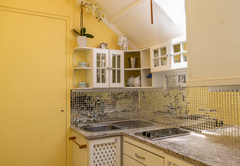 Pretty Kitchen, eating area with Sat TV, Flatscreen, DVD, Lovely new en-suite bathroom with shower-bath. Spectacularly close to the waters edge. Queen size bed, Sat-TV + DVD, lovely open plan kitchen with eating area. French doors lead onto terrace and garden. Delightful apartment, nice bathroom with Jacuzzi + shower + rain shower. 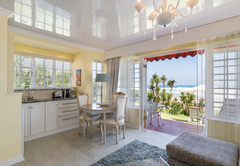 Sea-Cottage, with open plan kitchen and living area. Sat-TV, DVD, Flat-screen, 2 couch-beds in living area. Separate bedroom with twin beds/king size beds. Bathroom with new shower-bath. Lovely terrace. 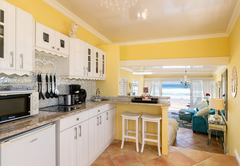 Sea-Cottage, with open plan kitchen and living area. Sat-TV, DVD, Flat-screen, 2 couch-beds in living area (for 2 children). Separate bedroom with twin beds/king size beds. Bathroom with new shower-bath. Lovely terrace. 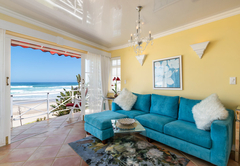 Situated on the first floor and only meters from the beach, has panoramic sea views. 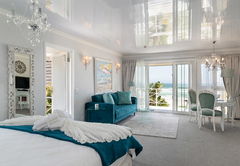 Queen size bed with sea view . Sat-TV, DVD, CD Pl. new Bathroom with jacuzzi + shower. 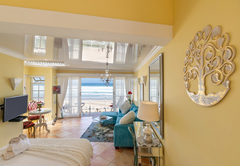 Separate, small dormer bedroom with queen bed with sea view for 1 person. Response timeHaus am Strand typically responds to requests in 5-10 minutes.